25 years, 17 games, three Triforces, one princess, one evil king, one hero, one legacy. 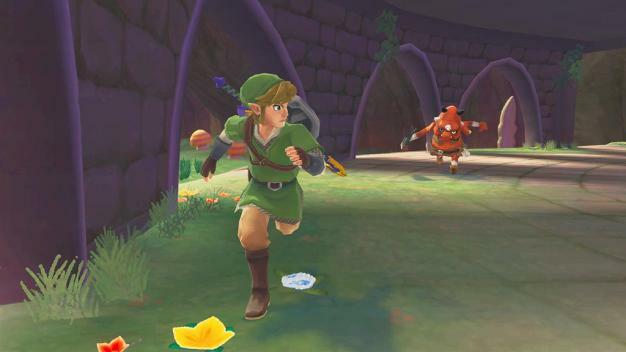 The Legend of Zelda has had a long and colorful quarter-century. It started off as the premier action-adventure-RPG hybrid, featuring a wide open world to explore, full of nooks and crannies, enemies to defeat, and treasure to uncover, and starring an iconic hero character who grew in skills and strength over the course of his journey. I’ve chattered at length about how this is the essence of The Legend of Zelda, but now it’s time to talk about a new entry in the series: Skyward Sword. 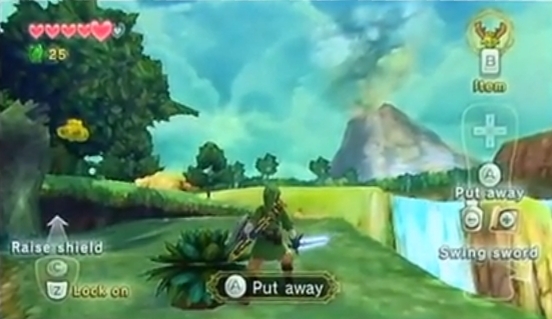 One of the first things I noticed about Skyward Sword‘s game world in the demo is that, while it’s not a totally open world – there are still land boundaries surrounding the demo area – it’s also not a “corridor” type area like many of the places we’ve seen in the games since Ocarina of Time. Look at the opening shot, which pans out to view the whole forest area, with all its criss-crossing pathways and hidden secrets, and then drops you right smack in the middle of it. It’s also a full world, in the sense that there are enemies to fight and places to investigate around every corner. If what I’ve seen is a representative sample of everything there is to offer, there are at least eight different types of enemies in the demo – and that’s not counting the Stalfos and the scorpion boss. (For those of you keeping track, I’ve spotted Deku Babas, Gold Babas, Bokoblins, Keese, Octoroks, Gels, Zols, and Walltulas.) We haven’t encountered this level of variety in a single area in any Zelda game before, period. Of course, this is just a demo, so it may be that the enemies will be more segregated in the final game, but it’s still an exciting notion to wrap my mind around. The fact that there’s just so darn much crammed into such a small section of the overworld is also really encouraging. Previous games usually just introduced new scenery along the borders of another area – think Ocarina of Time in particular, where we began to see a desert landscape as we approached Gerudo Valley and the river as it snaked its way down from Zora’s Fountain. 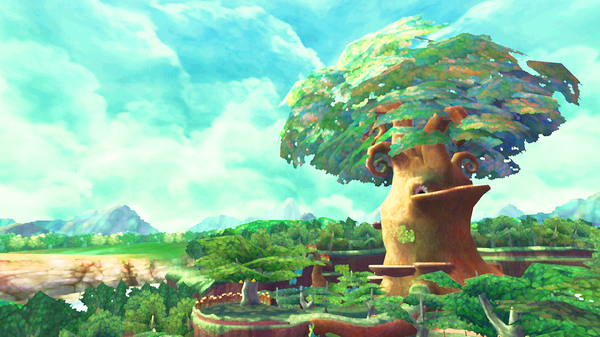 Skyward Sword looks to have varied setpieces in place just for the heck of it – see the man-made complex featured in the screen below. Of course, if you’re an eager enough explorer you might find your way onto the cliffs that border the area, and some have even discovered a spot with a rewarding view of the surrounding landscape. A real challenge with Twilight Princess was that as development moved from the earlier stages into the latter half, that balance was lost. The 3D Modeling Team was steadily expanding the size of the game, but the actual content of the game was not keeping pace. The longer the 3D modeling and the content remain out of step, the more sparse the game becomes. Or, game content starts interfering with other content and spoiling it. Trying to get that under control is a real challenge. Putting it another way, perhaps it’s controlling the balance of “sparsity” and “density” that actually makes a Zelda game. Aonuma: There was a sense that we had made The Legend of Zelda: Twilight Princess too big. We felt like we weren’t able to fully leverage its scale and not quite package it into one solid piece. So we wanted to make sure we first built a strong foundation for the game and then create a compact, yet solid playing experience. Iwata: I see. You’re not saying there was too much to enjoy, but rather you might have been able to increase the density of game elements while packaging so many stages and other ideas in its vast world. Miyamoto: Yeah, it’s really more…it’s not about game density, but about the density of play. Put this all together and it looks like we’re going to get an overworld that’s more like that of the classics, where we didn’t traverse across wide open fields but instead had to navigate our way around an obstacle- and enemy-filled world. If the Skyward Sword team can stay true to this vision, we may be set to play in one of the most dangerous incarnations of Hyrule yet.